The very best for your Conures! 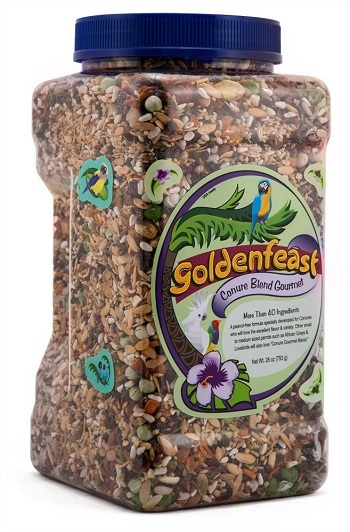 More then 40 ingredients especially blended for conures and other small to medium sized parrots. Ingredients: Hulled oats, Safflower Seed, Canary Grass Seed, whole canatalope seed, buckwheat, White proso Millet, granola made with rolled oats, whole wheat, brown sugar, canola oil, natural coconut, oat flour, roasted almonds and honey, roasted corn, whole raw pistacios, roasted cashews, non-roasted sunflower kernels, roasted almonds, red and green sweet peppers, pepitas, cooked and dehydrated chick peas, sweet potatoes and cooked assorted beans, beets, cranberries, whole star anise seed, papaya and pineapples, carrots, blueberries, soy nuts, whole bee pollen, tomatoes, freeze dried sweet garden peas, and natural flavorings. No artificial dyes or synthetic vitamins. Does not contain peanuts.